Giveaway is officially closed. Winner to be announced soon. some sewing supplies or lovely handmade items. 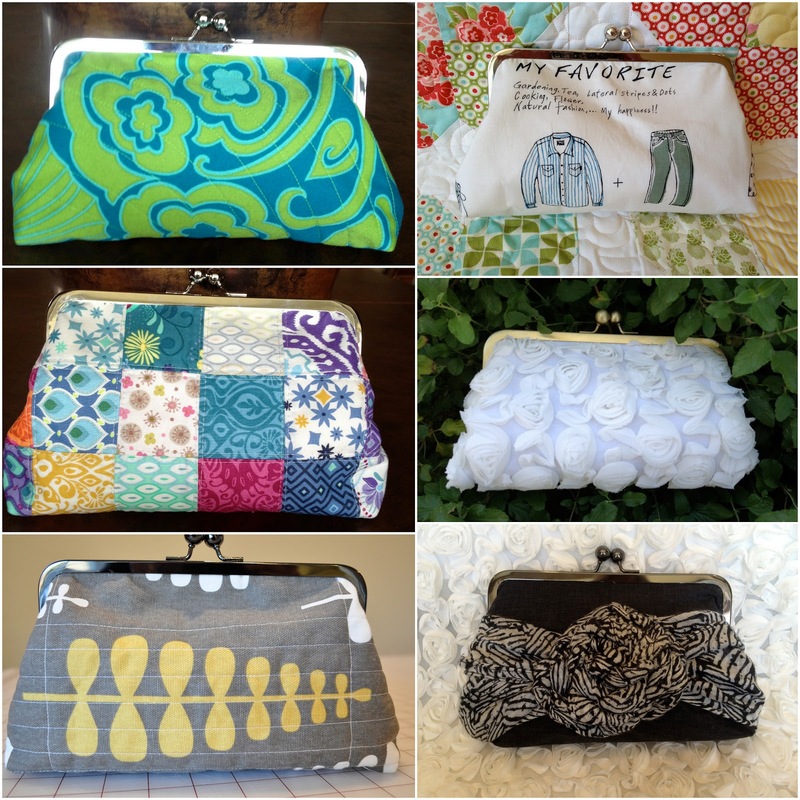 I have loved making framed clutch purses over the last year or two. They make a quick and easy project and an impressive gift. along with the frame and Guttermann glue you need to make your own clutch. that I think will make a really cute clutch for summer. 1. Just leave a comment of your favorite summer vacation memory. 2. If you follow my blog you get an extra chance, just leave a comment if you do. Entries will close at 5 pm PST, Friday, May 10. I will draw a winner Friday evening. I will ship anywhere in the world. Good luck! To follow through Bloglovin just click the link at the bottom. I loved camping with the family and washing our hair in the rain water coming off the tent tarp!!! Great gift for the giveaway. Thanks for being so generous! I just love the sunshine!! Going to Bethany Beach with my family was a great summer vacation. Thank you. My favorite memory is going camping as a kid and meeting this boy named Jeremy who played the song Brown Eyed Girl for me on our last day. I was only 8 or 9 but I'll always remember... lol. what a lovely giveaway, thanks. My best summer holiday was a road trip through Germany and Austria with my now husband. He proposed on the trip, so that helped but it was a great trip all around! I loved going to camp when I was a kid. I actually researched camps for adults the other week when I was feeling nostalgic. Thanks for the giveaway! Last summer, to celebrate our son's college graduation, my husband, son and I went to southern Utah and hiked in Zion, Arches, Bryce and other parks. The scenery was amazing and being together for the 8 or 9 days was fabulous, since our son was just about to move 900 miles away. One of our best trips ever. I follow via GFC. Thanks for the great giveaway! I do love to go camping anywhere my family is. But I do have to say my fave was going to Nashville with a dear friend MANY years ago! Oh memories! Of course I follow. And I got my bag done with minimal (for me) swear words! My favorite summer vacation memory was probably when my husband returned from his first deployment. We were just dating at the time but he showed me an awesome time. DisneyLand, Knotts Berry Farm, In - N - Out Burger!! !, Santa Monica Pier, and Vegas for my 21st Birthday! It was a great vacation but sad when it ended because he had to go back to Iraq. When he returned home at the end of the year he proposed and we'll be celebrating our 7th wedding anniversary this year! Thanks for the weet giveaway! I love frame purses! Thanks for the chance! My favorite summer vacation is going home to visit family when all the nieces are off on summer break! We spend a lot of time on PEI during the summer and spending it with my grand kids makes it that more presious. My favorite summer memories are from when my sister and I took our kids and husbands and rented a beach house for a week - so fun and relaxing! Favorite summer memory was a big extended family vacation we took the summer before my grandmother passed. I think my grandparents knew it was the last opportunity for the whole family to gather (my grandma had been sick) so they wanted to arrange it. Love the clutch kit - thanks for the opportunity! fab giveaway, how about if i win, you make me a little clutch, and then send me the instructions, so I can use your one as reference for the others i make, is that too cheeky?!? ;o). Only kidding, fingers crossed! My favorite vacation memory is a trip I took to Seattle with my husband before we got married. I loved the city. We ate great food and shopped at such cool shops. We had such a good time just walking around and seeing big city life. Following! By the way, I have been dying to make a frame purse and will checking out your shop! My favorite summer memories happened all up at Holden Village in WA, wonderful times! I love frame purses, thank you so much for the chance of winning this fab prize. My favorite summer memory is taking my son to the Pacific Ocean for the first time. When he saw it, he commented on how big the ocean was. I died laughing. I don't know if he expected it to be little or what. After my husband returned from an overseas deployment, we took our two sons to Germany to see where we lived and all the best sights! Such fun!! I follow your blog :-) Thanks for the wonderful giveaway chance! Best memories are going to the beach with the family or running around our neighborhood like heathens!! I am a follower, thanks for the chance love your clutches! Best summer vacations were when we rented a BIG beach house (that sleeps 10 or so) and a bunch of us would go. Those were awesome weeks. No doubt about it, camping is always so much fun and builds great memories. Thanks for this wonderful giveaway. Favorite summer memory ... working for the conservation department and finding my hound, who has been my buddy for the past 10 years. My favorite vacation is staying with two of my daughters that live 2.5 hours away. I know its not very far, but its a vacation to me and I love being with them. I'm a follower on bloglovin and instagram. My favorite vacation memories are simply the excitement of going new places and trying new things. Our favorite family vacation was to St. Louis - so much to do! Fabulous giveaway - many thanks! I follow your blog by email. Thanks for a fabulous giveaway! Love frame purses but never have tried to make one! I loved going to the city pool and buying popsicles with quarters during adult swim. The best. Thanks for hosting this giveaway! I loved visiting my aunt in Boston. When I was at home, I loved having endless time for reading. Oh thank you for the giveaway, what a great kit! My favorite summer vacation memory... maybe going to a work picnic of my Mom's one summer - they had garbage pails full of soda, rowboats for the lake (which was covered in lilypads) and all the ice cream sandwiches you could eat! Dad and I getting stuck at low tide trying to return a rowing boat on the River Dart Estuary, and having to drive back to the holiday home starkers, just with towels, as we were head to toe in mud! I spent a fabulous six weeks in Europe two years ago! The memories keep my going on dreary winter days (like today) in Melbourne! Thanks for the chance to win! I always liked reading during the summer. I follow you via my RSS reader. Thanks for the chance to win. Endless days in the beach (having lunch there) with my mum and dad playing with me. Thank you! A favorite memory is travelling across Canada to Banff and Jasper - it was a great trip and we still laugh about some things that happened! I follow your blog via Bloglovin' - thanks for an extra chance!! My best summer vacation was last year when my grandaughter came to visit. She was such a joy. Family road trips with all the "educational" stops that I hated at the time! One of my favorite vacation memories is from early on in our marriage when we spent a week on a lake in New Hampshire and woke up in the middle of the night to the beautiful sounds of the loons on the lake. We vacation at the same place each summer still, and hearing the loons at night is still one of the things I look forward to most! I'm a follower too! Love your little bags! My favorite summer vacation memory is going to camp when I was in jr high & spending time away from home for the first time. Thanks for the chance to win such a nice giveaway! Your clutches are so cute! I spent time at the beach every year with my family! I love getting up early and taking a long walk on summer mornings. I normally don't like making small items, but your clutch is really cute. Thanks for sharing during the giveaway day! camping with our kids! Our daughter decided she was "all full of tent"
Every year in the summer my grandparents rented a beach house for all the grandkids to spend a week at the beach! The summer my mom and I traveled to London together we had so much fun! Going to Lake Mead with my family to water ski & knee board! Camping at the ocean with family and friends. Lovely times! I am a follower! And greatly enjoy your blog ~ Thanks! I loved roasting marshmellows for smores! My favorite is or hiking trips out west with my kids. We have so much fun together. Already a follower and lovin the clutch too! Best summer vacation was camping at the beach. I love the times we spent on the lake when the kids were little and all the nieces and nephews were around...not as much fun with just the husband and I now! I enjoy following you on Google. I have very fond memories of a vacation to Prince Edward island when I was 17 with my parents. Boy did I make everyone miserable but I really did have fun! My favorite trip was a road trip to Mackinac Island. My daughter still talks about it years later. My favorite trip was my honeymoon in Jamaica! My favorite summer vacation memory (now) is the two weeks our family borrowed a trailer and went to many national parks. I don't think I appreciated it at the time, but now I have fond memories of it. Every chance we got for a Summer vacation we would go to the beach. Now that I have my own little family we have moved within 15mins drive from the beach. It is just heaven - although we never visit there much. I have become a follower too - just loving the back posts on your blog. Our reunion with our children when we all went to disneyworld together and got caught in a huge downpour. We had to dry our shoes in the oven! Lots of great memories !!! Going to the beach with my husband! thanks for this giveaway! I used to love camping w my best friend's family. Thanks for the giveaway! I loved how every summer growing up, my family would go on road trips. My favorite one was to California - we went to Knott's Berry Farm, which was very fun. I would so love to win one of these pouches. My favourite summer vacation memory is really the same as my summer vacation plan, to spend some time on the west coast on an island where nothing much happens and I can garden or go to the beach. Of course, there was the day and long night that the island was on lockdown because a murder was being chased through the woods, so sometimes it is exciting too. Of course I follow your blog and I would love to win that pattern and the bits and pieces to make a purse. Acting super cool, pool side with my best friend in Las Vegas. Of course sipping virgin margaritas, as we were underage. Family tent camping in the Santa Cruz mountains of California! I am desperate to learn these little bags and totes. The holiday disasters come to me first, what does that say about me?! I had a really nice trip to Prague a couple of years back, the food was excellent. I love all the train journeys we used to make across India every summer holiday. Thanks for a lovely giveaway - I would love to make one of these purses. I am a follower on Blog Lovin. As a kid, summer was Christmas time for me! Very fond memories of big family BBQs for lunch followed by an afternoon of games. Speding hours at the beach digging up sand and building sand castles. Every year again! Our first and unfortantly last holiday together with my brothers family in Sardinia - it was so loly at the beach! Fishing with my dad as a kid. My favorite summer vacation memory is going to Hilton Head Island with my family every year! My favorite vacation memory is when we swam with the dolphins in Cozumel! Laying in the grass watching shooting stars with my kids! Amazing giveaway,thank you for the chance to win it.when we was kids we spend every summer at our grand parents in the country,we had the best times!Have a lovely day. I had an amazing 2 weeks on Fraser Island with my new boyfriend when I was much younger. Now he is my husband and we both remember those days fondly. My favorite memories of vacations are from when I was a kid and we went on family camping trips. My best summer vacation was when all the family got together in Branson, MO for my 60th birthday. I love waking up and seeing the sun rising over the water in our beach house we rented a few years ago. Heavenly. Every summer growing up we used to spend to months on the Island of Menorca off the spanish coast. It was magical and some of my best friends are my "vacation" friends. we loved it! Making faces at the camera while riding rollercoasters. Thanks for the giveaway! Living in Minnesota summer is all about enjoying one (or more) of the 10,000 Lakes! Thanks for the giveaway! My fav. summer memory is biking around the neighbourhood with not a care in the world. san antonio with my family. We didn't vacation much so this was a big treat! For our 30th anniversary, my husband and I flew to Las Vegas and had an Elvis Impersonator guide us through renewing our vows. Our parents and kids watched via a live feed. We have done NOTHING crazier than that. Ever. Ooh, I've wanted to give these a try! What a lovely giveaway, thanks for the chance to win :) My favorite summer vacation memory is going to the ocean! Amazing giveaway! You have a nice pile of my favorite things right there :) Love that print on top - it grabs me every time. Favorite holiday memory is when B and I went to Turks and Caicos to spend a week relaxing, deciding if we'd move from the US to Ireland. It was not only a beautiful place, but a huge turning point in our lives. Will never ever forget it. I'm a happy follower too! Favourite summer memories are those of camping and hiking in the mountains with our kids. Good times! Floating in the Mediterranean sea with my hubby! every summer from 2002-2010 we went with friends camping in the ouachita national forest in arkansas and loved our time there swimming and relaxing... so there's not just one memory but an overall collective good memory/feeling thinking back on the times we spent together. We drove from Texas to North Carolina every summer to see my dad's family. It was the best part of every year. I miss going back and seeing everyone. It is much harder these days. I like going to the great lakes! Boating and fishing with my grandkids. Thanks for the giveaway chance! I'm a new follower through bloglovin! I remember 2 great travels to Pyrenées mountains. My favorite summer was when I was pregnant with my youngest child and spent the summer just hanging out with my two older toddlers. My family never really took vacations when I was a kid, but some of my favorite times where the times when I went to church camp. I had lots of fun there. Hi Di! My favorite summer memory is spending time on my grandparents farm in TN. We would spend our days on horseback and have fresh food from the garden for dinner every night! I loved going to see my cousins in Montana with my family. Fun times. Thanks for the chance at your giveaway.